Community service is an integral part of the curriculum at Carlisle School and starting in early grades, students are accustomed to performing service projects throughout the year. Projects are often student-led and can range from food and coat drives for the needy to collections of pet supplies for animal shelters, but one project, in particular, has made a positive impact not only on the students at Carlisle but also for families across the globe. Service Club partnered with the African Library project of Pittsburg, California to organize a book drive. The collected books would be used to help start a library at the Ngodhe Primary School in Kenya. 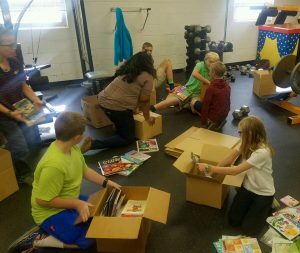 During the collection process, the students at Carlisle reached out to their student body, parents, and grandparents to collect more than 1,000 new and gently used books. After the books were collected, they were packaged and sent to staff at the African Library Project which delivers donated books to help establish libraries across the continent of Africa. Since 2005 the African Library Project has developed more than 2,620 libraries in Zimbabwe, Zambia, Cameroon, Lesotho, Nigeria, Botswana, Swaziland, Malawi, Ghana, South Africa, Sierra Leone, and Kenya. In June 2018 the books were transported by a team from the African Library Project to Kenya and delivered to students and teachers at the Ngodhe Primary School. Sharon Allen a Project Humanity Volunteer with the organization was among the travel party who delivered Carlisle’s shipment of books. 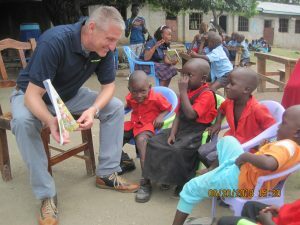 According to Allen, the school is on a small island an hour away from the mainland and on the day that the organization visited, “many students were away from the school participating in a competition.” Since the remaining children were having a free day, Allen reported that they “got to help unpack the books [Carlisle] sent and spend lots of time reading to the kids.” She noted that the students also entertained their travel party and added that the donation of books made a wonderful impact on this school and community. Carlisle School students will be conducting another drive again this spring for the African Library Project. The book collection will kick off on April 15th, coinciding with the opening day of Carlisle School’s Scholastic Book Fair which will allow donors to purchase new books to send in addition to donations of gently used books. There will be collection boxes at the Book Fair and in the Middle School lobby for all donated books. Gammons noted that books donated must be for primary or secondary students and cannot be titles associated with holidays, religions, or American history. Over the next few weeks, students will learn about the various countries in Africa to determine which school they would like to support this year. In addition to books, the students will also collect donations of cardboard boxes, trash bags to weatherproof the books, shipping tape, and approximately $500 in shipping costs to fund the library. Donors who wish to contribute to the shipping costs and supplies can send checks to Carlisle School, Attn: African Library Project, PO Box 5388 Martinsville, VA 24115. Carlisle School is an independent college preparatory school that provides a positive, safe environment for academic excellence and character development while embracing diversity and preparing our students to become leaders as citizens in a global society. Additional information can be found at www.CarlisleSchool.org. The African Library Project changes lives book by book by starting libraries in rural Africa. Our grassroots approach mobilizes U.S. volunteers, young and old, to organize book drives and ship books to start or improve a library in Africa. Our method makes a concrete and personal difference for children and communities on both continents. Additional information can be found at www.africanlibraryproject.org.